The Kneejerk reactions are over, now we can look at it objectively. Last week, Europe took shape for another season. It’s actually one of the most important days of the season, because really, it determines how successful a team will be. Last year Leinster were given a handy enough group. This allowed them to finish first, get a favourable home draw against an inexperienced side, and end the season as European semi-finalists, despite the fact nothing about their league form suggested this. Contrast this with Ulster, who were given an absolute stinker of a group, and Munster who were also given a tough ask. Both provinces had successful Domestic seasons but crashed out at the group stages. Had Leinster been in Ulster’s pool, there would have been no glimmer of light to a poor season. Had Ulster not been in the same pool as the eventual winners, they may have been able to have a longer campaign. The draw marks the day the word “realistic” arrives in front of the word “expectations”. Europe has a different vibe this season, as there is a World Cup to be had first. The tournament begins at the later time of November, when the bigger event is finished. Injuries, momentum and disasters will very much affect every team in the competition. A good World Cup for some key players could set a team on their way, or derail their opposition. Similarly, fatigue and injuries could completely destroy a squad. When the draw first happens, there’s a buzz in the air. It’s a moment before the real moment. As it happens live the points calculation begins, we all jump to conclusions somewhere between “we can win this” and “we’re gone”. So it’s a good idea to take a step back and have a look at it again after a week’s past, when all the excitements died down and the event itself is over. We can look at the content of the draw, rather than all the pageantry around making the draw, it’s not too far off the Eurovision, but with a more formal dress code and less Scandinavians. So let’s have a look at what the draw for Europe brought about. The first bit of news we got was that Lyon would be the host city for the 2016 European finals. Last seasons venue, Twickenham, was an unimaginative and rushed choice. Not because the stadium was not fit to host the final, but because with this year’s World Cup taking place in England, we are all going to have our fill of Twickenham. The same case could possibly be made for Lyon as the 2016 host. Euro 2016 takes place in France next summer. There is already going to be an atmosphere of anticipation in the air for a big tournament, just of a different sport. It seems like the rugby will be shoved into the country in May and then rushed out as their real showpiece draws nearer. The last time France hosted a football tournament was 1998, when they went on to win the World Cup. There’s going to be a whole lot more focus on the country hosting an event that occurs once every four years, than a tournament the French are fairly used to winning by now. We also learned that 2017s finals will take place in Edinburgh. This was a good choice. The new competition format was laid out entirely for the English and French sides benefits. Having the final in Edinburgh could bring back some of the magic the tournament has lost since it’s Heineken Cup days. Murrayfields a great rugby stadium, and deserves to showcase a big event. But that venue announcement was not the main event of the day. That was the draw. Before I get into breaking down whose name got put where, I want to have a quick grumble about something that frustrated me about the way the tiers were laid out. Before 1pm last Wednesday, we only knew three of the five teams in tier 1, these were the three champions of the top leagues in Europe. The contenders for the final two places were to be given to two of the runners-up, Bath and Clermont got the places at the expense of Munster. But how was it decided that these two clubs were two of the top five teams in Europe? A completely random draw, their two balls were picked out. That hardly strikes fears into an opponent. You may have also noticed that at no point in this discussion for the teams in the top tier of the draw have the reigning champions Toulon been mentioned. They sat neatly in pot 2, was losing to Stade Francais in the Top 14 semi-finals was enough to make the tournament organisers forget they just won the competition about a month ago? European performance needs to be taken into account when ranking the teams. Surely Toulon have much more of a claim to a top tier place than Bath. If they take the teams performance in the league the previous season, and add it to their performance in the European Cup the previous season, they will get a much fairer reflection of where the teams rank. I can accept the league champions being top seeds, but not the European Champions being second seeds while the team they beat in the final are now ranked above them. To be fair, it is still a little better than the previous ranking system, where teams would be ranked on how they did in the last few editions of the European Cup and league performance was completely disregarded. Onto the actual draw itself. At the beginning of this article I talked about how Ulster were given a terrible group and if Leinster had had the same draw they wouldn’t have been semi-finalists. We’ll this year a fair compromise was reached, both teams were handed brutal draws, with Munster getting off pretty well. Leinster were put with three opponents they faced in last seasons tournament, Bath (who earned the right to be called one of the best teams in Europe by being drawn out of a bowl before Munster), Wasps (the new home of Jimmy Gopperth, as well as Brendan Macken), and this French side called Toulon (who are nothing to worry about because they were only a tier 2 side after all). This is the only group in the tournament with four teams that got through to last years quarter-finals. This is an exceptionally tough ask for everyone involved. Toulon go in as favourites, not just for the group, but the tournament. However, they are an aging squad, and with the age comes two things, wise minds that can close out a game, and old legs that may not be able to go 80 minutes. However they to seem to have found the cure for old legs, they have an incredible squad depth, they can take off a world beater and replace him with another world beater, which is a luxury no other team in the competition has. The addition of Paul O’Connell provides us with an interesting sub plot. The giant will be hungry for another European Cup before retirement, and will be more than willing to go up against his old rivals, this time with a super team. As I say, this is an aging squad, and with that comes the knowledge that this may be their best chance to win another European Cup, as the season after may be too late, which only works as added motivation. Wasps in theory are the weakest team, but they managed to come through as best runner-up last season, and they put it up to both Leinster and Toulon. Leinster got away with it a bit in both of their games last season, and Wasps will be itching to get that win that evaded them, and Jimmy will be itching to show the RDS that he can play a whole lot better than he did last season. Bath are the team that could do some unexpected damage hear. Bath have some key players from the English squad. If they have a good World Cup, which is pretty realistic, they could be on a wave of momentum. The reason they lost their quarter-final game last season was a lack of experience. They now have that bit of experience. These factors could combine to make Bath a very dangerous side this season. Leinster also have some key players in the Irish squad, who will have a very good World Cup as well. The difference here is that in terms of management, we are very much in a transitional period. And with so many key players missing the opening games in the Pro12, we could have a lot of catching up to do in the league, and a hard enough time integrating some players back into the line-up. As a club, we are in a difficult place, that may mean we only see six European games this season. Unfortunately from a rugby point of view, this pool may see three good sides out. Toulon will likely top it, but there are no guaranteed bonus points anywhere, it is likely everyone could win their home games and only pick up a losing bonus point or two on their travels. 14 points will not be enough to secure a best runners-up spot. But on the bright side, there are no bad games in this pool. Also in a tough group are Ulster. Once again they’ll face Saracens, as well as Toulouse. Very much the fourth team in this group are Oyonnax. It’s actual their first time in Europes top competition, and they are getting thrown in at the deep end. The shark invested deep end, and they’re blindfolded. As John mcClane would put it, “Welcome to the party pal”. They won promotion to the Top14 back in 2013, and qualified by finishing 6th in the league. They ran Toulouse close in the quarterfinal, and it took a late Cyral Baille try and a near perfect kicking performance from Toby Flood to eventually see them off. They aren’t necessarily pushovers, they have danger in the form of Ivorian fullback Silvere Tian and the Top14s second highest points scorer Benjamin Urdapilleta. They have also signed Piri Weepu, which gives them some additional experience in the scrum-half department. It’s still hard to see Oyonnax pull off a shock here and somehow manage to qualify, but they will offer a difficult away trip for the other sides in the pool. 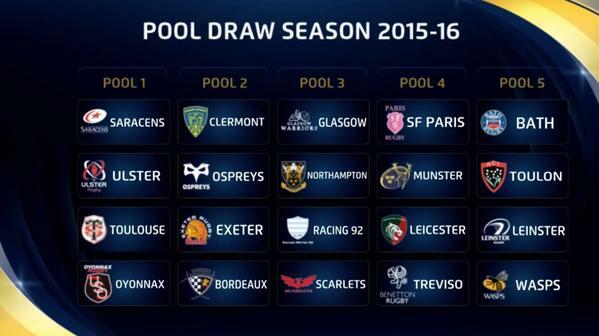 Saracens to me are favourites here, with Ulster and Toulouse looking for a runners-up spot. The English champions have come out of their last four pools, and have a strong enough side to top the group comfortably. I would argue that after Clermont, they are the best side to not win Europes premier competition, and they have a good chance of changing that this time around. Toulouse may just have a slow start trying to cope with life after Guy Noves, made more complicated by welcoming players back into the squad after the World Cup, so Ulster have a good chance of progressing as best runner-ups. All is not lost for the Irish provinces hopes of having a home semi-final in the Champions Cup, as Munster were handed a condolences card for losing Paul O’Connell, in the form of a very favourable draw. Stade Francais winning the Top14 was the best thing to happen to Munster rugby in the last few seasons, as it provided them with a far easier top tier team, as well as eliminating the risk of getting another top French side. It’s not that they are a bad side, it’s just that in comparison to the other tier 1 sides in the group they aren’t anything to fear, if they are the supposed best team in the pool then there isn’t a whole lot to worry about. Treviso don’t have the quality to challenge in terms of qualifying, but I would bet on them pulling off at least one upset at home. I think we are looking at Leicester and Munster both coming out of this pool, but I’m consider Munster as slight favourites here, purely because I think they are more likely to grind out a result at Welford road than Leicester are at Thomand. Munster have a great opportunity here to not just top the group, but be one of the highest ranked quarter finalists and get a winnable home game by virtue of drawing an Italian team and a weaker top tier side. Pro12 champions Glasgow we’re drawn with Northampton, Racing 92 (they are officially no longer Metro) and Scarlets. Glasgows strong home form, and the fact that they finally crossed the line and won the league last year, could see them come out of this one. Northampton have plenty of attacking threats with George North and Luther Burrell. Hopefully JJ Hanrahan can find the form to make him their first choice fly-half and give Ireland another option. I see Northampton topping this group and Glasgow contending for a best runners-up spot with Racing. Racing had a great pool campaign last season but failed to close out the game against Saracens which was there to be won. In addition to Castrogiovanni, they’ve brought in Dan Carter, who if he can avoid any more serious injuries, could kick them to 2nd place, but kicks don’t get the bonus points they may need. Scarlets have shown that they can put it up to the bigger teams, by beating Ulster, Leicester and Glasgow last season. However, they don’t do it consistently enough, which is why they tend to qualify on the basis of having six other teams worse than them. They had a poor Anglo-Welsh Cup and were not convincing in victories agains Zebre, Dragons and Treviso toward the end of the season. Their inconsistency will lead to a pool stage exit this season. Pool 2 consists of last years runner-ups Clermont, European under-achievers Ospreys, winners of the play-off Bordeaux Begles, and Exeter Chiefs. Clermont should comfortably top this pool and will likely finish as the top ranked team in the quarter finals. This pool could see an outsider make it to the quarter finals over a more established side. This pool represents Ospreys best chance of making it to the knockout stages in a while, but I give Exeter Chiefs the edge here. They had a good Challenge Cup last season and only missed out on a playoff place in the premiership on points difference. Only two Welsh sides have made it to the quarter finals in the last six seasons, they just can’t seem to pull it off. Ospreys have gone from serious Pro12 title contenders, to serious Pro12 semi-final contenders in the last few years. Exeter are a solid team with enough togetherness to see them get through to the knockout rounds as the eight team. The Champions Cup provides us with some great matchups very early on in the competition. As we saw last season, reducing the tournament to twenty teams and only five pools means some good sides won’t see knockout competition. But it also assures that ultimately the best teams will win out, and whoever comes through each of these close groups deserves it. Outside of the top competition, the Challenge Cup provides all the other teams in the Pro12, Top14 and Aviva Premiership to go on the hunt for some European glory. As Irish rugby supporters, we should look to Connacht for a successful European campaign. They have been drawn with Brive, Newcastle Falcons, and the Russian qualifiers Enisey-STM. A general rule for European competition is if you haven’t heard of them you want to get them in your pool. An away trip to Russia will cause some difficulty for the league fixtures either side of the tie, but it’s worth it to play the lowest ranked team in the competition, with no previous European experience. Of all the tier 2 teams in the draw who Connacht could have been paired with, Brive were the weakest. In terms of Newcastle, they were the worst team in the Aviva Premiership last season not called London Welsh, and they are very beatable. It’ll be a tricky away tie, but at least a losing bonus point is there to be had. Connacht can top this pool ad go on to have a successful Challenge Cup. They improved immensely last season, and this is a big opportunity to challenge for some silverware. Last years champions Gloucester will be one of the favourites for the Cup. They should top their group, which features La Rochelle, Zebre, and Worcester. Pool 3 may earn the title of ‘group of death’ for some. Harlequns will be another of the favourites for the competition. They’ll have to overcome Montpellier, and a Cardiff blues side who will be looking to rectify a really poor season. The odd one out in this group are Italian qualifiers Calvisano, who don’t appear to have much hope here. Last seasons runners-up Edinburgh have a tricky but winnable pool with plenty of Irish interest. They face Grenoble, coached by Bernard Jackman, London Irish, and Agen, who recently announced the signing of Dave Ryan from Ulster. Pool 2 sees Sale Sharks, Newport Gwent Dragons, Pro D2 champions Pau, and a Castres side who really were brutal last season. It looks like it’s going to be between Sale and Dragons in that one. The fact that the Challenge Cup is made up of a mixture of last terms under-achievers and teams that are there to make up the numbers makes this an intriguing competition. Despite the draw being made, the anticipations has not quite started to build just yet. Everything else rugby that happens between now and the end of the year will be overshadowed by the World Cup. Some te.ams don’t have managers just yet and there are still transfers to be made. Truth be told there’s too many different variables in the way to predict how the season will go. Depending on how long each country stays in the World Cup and which players are still standing at the end of it, and what teams have made ground in the league during those months and what teams will need to turn their domestic season around, there is plenty to happen before the matches themselves kick off. In fact, they still have to be scheduled. Nonetheless, we know who’s going to play who. and we can be safe in the knowledge that the pool stages of the 2015/16 European Champions Cup are going make for an entertaining stage competition of Europe’s top competition.